Jill Biden, wife of Vice President Joe Biden and Second Lady of the United States, kicked off the 35th Marine Corps Marathon in Arlington, Va., this morning. Dr. Biden visited with marathon runners before the Sunday race and spoke with hand-cyclist and wheelchair racers. As of Sunday morning, the race took place without a hitch. D.C. Fire and Emergency Medical Services reported on Twitter that emergency personnel had evaluated some 30 to 40 people. They transported three runners to area hospitals for observation or treatment. Other safetey concerns emerged for this year's Marine Corps Marathon in the wake of a series of shootings against various military installations in the area -- a case that remains unsolved. Though security was heightened, officials did not find any trouble. As for the race itself, Air Force 2nd Lieutanant Justin Bradosky pulled away in the final stretch. He won with a time of 2 hours, 23 minutes and 30 seconds. 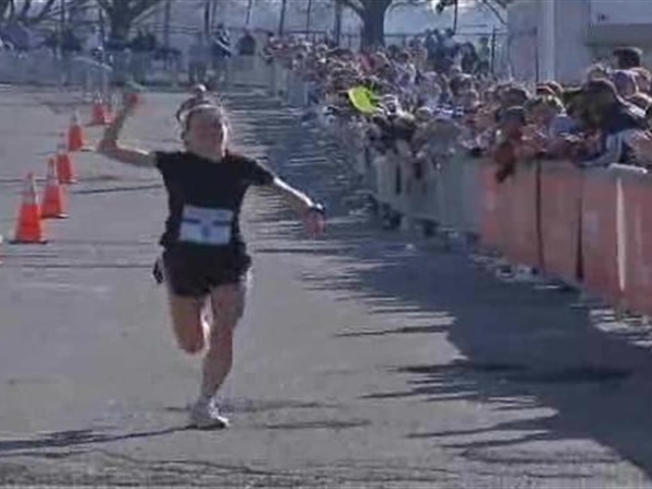 In the women's marathon, Kenyan Janet Cherobon won the race with a time of 2 hours, 42 minutes and 38 seconds.